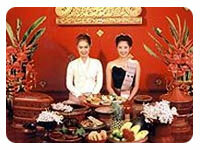 Relax in an informal atmosphere while dining on delicious northern Thai cuisine called “Khan Toke”. Tuck in and eat to your heart’s content. 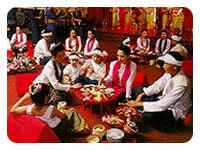 During the meal, a traditional northern musical ensemble will play soothing music while charming dancers will entertain you with the fingernail dance, candle dance, sword dance and ramwong dance. If you get the urge, join in the ramwong dance...it’s great. After that, there will be a fireworks display. Then, a selection of hilltribe dances performed by the Akha, Yao, Lisu and Karen tribes rounds up this entertaining evening. (Loose, informal attire is recommended as you will be sitting down on the floor).